Ann contemplates the little known Fifth Question: What exactly is this? In the time of Exodus, the Hebrews had to travel the desert without reading material. Seth bites down onto 5,000 years of suffering. 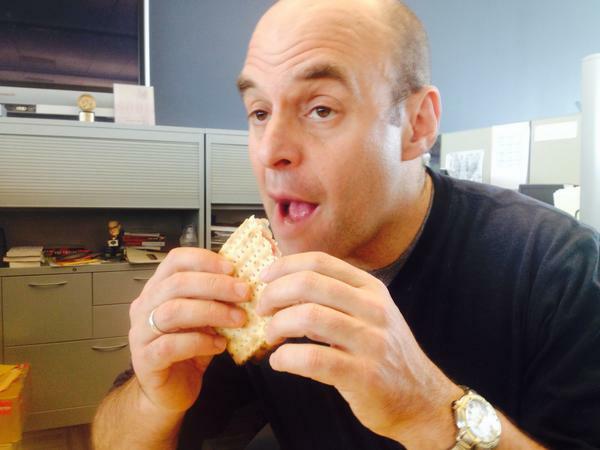 In keeping with tradition, Peter tries to eat the Passover meal while simultaneously complaining about his health. Editor's Note: This story was originally published in April 2014. 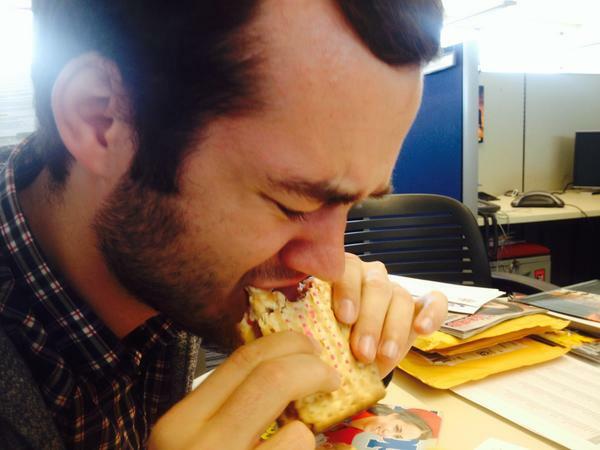 Why is this Sandwich Monday different from all other Sandwich Mondays? 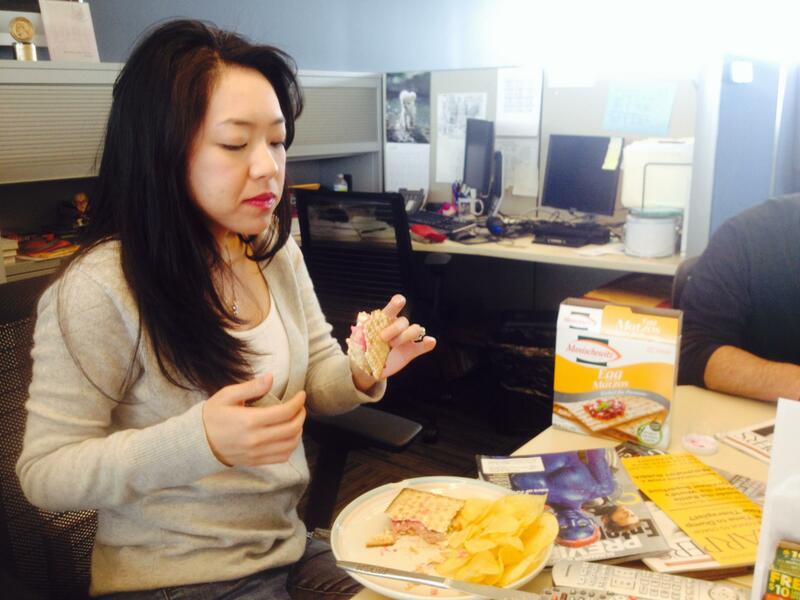 In honor of Passover, I introduced my non-Jewish colleagues to the wonders of the Passover lunch. It's not the Seder meal, but what I might have brought to school for lunch back in the 1970s, when the affluent Jews of suburban New Jersey ate tasteless food to remind themselves that thousands of years ago, they didn't have nice professional jobs like being a lawyer, or maybe a CPA. That's a steady living. I know David Birnbaum does nicely as an accountant; maybe you could look into that? So what's the sandwich? Manischewitz gefilte fish on Manischewitz matzo with beet horseradish, and Manischewitz potato chips on the side. 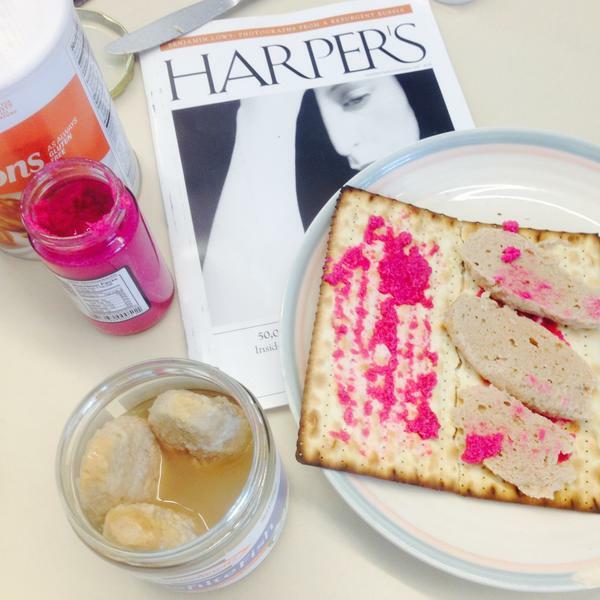 I took mercy on the goyim by using egg matzo and the non-jellied kind of gefilte fish. Peter: Eat, everybody. Seth, have some more, you look thin. Seth: If I was the Red Sea, and Moses tried to get me to eat this, I would totally part. Peter: Opening this jar of gefilte fish reminded me of my beloved grandmother Rose Scholnick opening a jar of gefilte fish. Lorna: Judging from the smell, probably the same jar. Miles: So I guess the ancient Hebrews said to themselves, "Hey, we're about to spend 40 years in the desert, how about we prepare ourselves by making bread that tastes like sand!" Lorna: There will never be a $5 footlong version of this anywhere. Peter: If there were, it would be a $4.99 footlong, special for you today only! Seth: I can't believe I ever complained about my mom's cooking. At least the first ingredient wasn't sorrow. Miles: I understand why the Israelites were so excited to reach the land of milk and honey. Finally, something that actually has flavor! Peter: Imagine their horror when they discovered the milk and honey were made by Manischewitz. Ann: My future mother-in-law would say, "Everything tastes good when you're hungry and you've been wandering the desert for 40 years." Peter: Do your Vietnamese parents get along with your future Jewish in-laws? Do they have anything in common? Ann: Yes. They both wish my fiance was a doctor. Sandwich Monday is a satirical feature from the humorists at Wait, Wait ... Don't Tell Me!